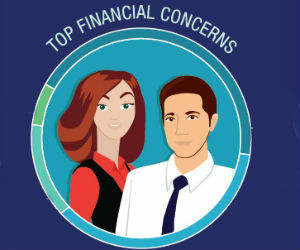 While the U.S. economy has rebounded, the financial environment is still cloudy to more than 50% of Generation Y (18-34 years of age), Generation X (35-54 years of age) and Boomers (55+ years of age) who have financial concerns, according to a recent financial wellness survey conducted by Harris Poll on behalf of the (MDRT). “It’s never too late to make resolutions and one area not to overlook is a person’s financial wellness. The findings in this survey reinforce the need for people to speak to a financial advisor and develop a tailored plan to accomplish their short and long-term financial goals,” James Pittman of MDRT said. According to the survey, 84% of Generation Y, 83% of Generation X and 66% of Boomers have financial concerns. The top financial concern among each generation is not having enough money in emergency savings funds, (51% of Generation Y, 50% of Generation X and 34% of Boomers). A close second for Generation Y (42%) and Boomers (31%) is not being able to pay off monthly bills, while almost half of Generation X (48%) fears not being able to retire when they want. “Most people have a spending issue that drives their insecurity. Setting aside a small amount of money can quickly turn into a few hundred dollars that can be seed money for an emergency fund,” Brian Heckert, first vice president at MDRT. The study reveals 38 % of Generation Y, 40% of Generation X and 29% of Boomers feel having no debt would make them most secure with their current finances. Having more financial education ranked lowest among each generation, Generation Y (4%), Generation X (1%) and Boomers (1%). Among credit card, mortgage, student loan and car debt, all three generations rank credit card debt as the debt they would choose to pay off first (29% of Generation Y, 40% of Generation X and 46% of Boomers). Generation Y ranks paying off credit card debt slightly higher than paying off student loan debt (29% vs. 28%, respectively). Paying off mortgage debt is ranked second for Generation X (29%) and Boomers (30%). Respondents were asked what expenses they would cut first to save more money from a list including dining out and traveling less, reducing home, entertainment and clothing expenses, and buying less expensive groceries and brands. When asked how they would adjust their spending if they wanted to save more money, all three generations noted dining out less, Generation X (32%), Generation Y (32%) and Boomers (22%). Reducing entertainment and home expenses were the next two top saving areas. “Saving just 5% on a monthly budget across all of these expenses could save the average family making $60,000 a year about $3,000 per year or $250 per month. That sum saved over a 10-year period would amount to a very nice fund for college or an addition to a retirement program,” Heckert added. When asked what the most important piece of financial advice is, millennials said it’s to start saving/investing (29%) and make a financial plan (28%). Their older counterparts noted paying off high-interest debt as most important, Generation X (28%) and Boomers (28%). Interestingly, close to half (48%) of Generation X said not being able to retire is one of their top financial concerns, yet only a mere 9% indicated saving more for a comfortable retirement was the most important piece of financial advice to know. According to the study, 50% of Generation Y, 35% of Generation X and 25% of Boomers have not done anything to prepare for retirement. Approximately 10% of millennials note they have spoken to an advisor to prepare for retirement, compared to only 7% of Generation X. “The hardest part of a financial plan is finding the time to get started. The new year is an excellent time to take control of your finances—and your future—with a financial plan and stick to it,” Hanna said.